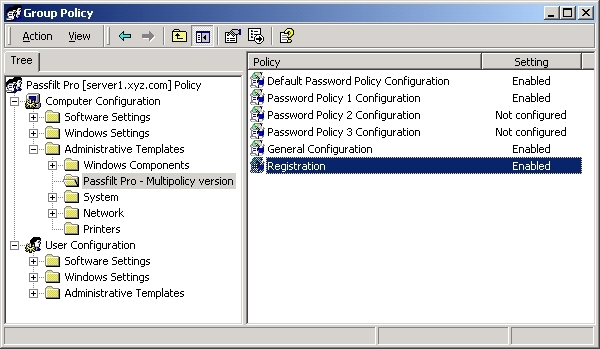 Passfilt Pro Multiple Policy Edition (MPE) supports up to 4 different password policies in the same Windows domain. Each policy offers granular settings to help companies enforce password complexity and compliance. Each policy can be associated with one or more global or universal security groups in the Active Directory. Each policy can enforce length requirements, character type requirements and even check the password against a list of known common passwords. Passfilt Pro can scan the new password against a list of 2 million common passwords in less than 1 second! Passfilt Pro MPE is installed on each Windows Domain Controller and is configured using group policies. Simply load our provided ADM template into a new GPO linked to the Domain Controllers container in the Active Directory. From there configuration changes are replicated within 5 to 15 minutes. With Passfilt Pro MPE, companies no longer have to weaken their password policies to the least common denominator (often a UNIX or mainframe systems that forces shorter length limitations and does not handle certain special characters). Having different policies for different groups can ensure that those users with access to more privileged information have stronger passwords that are less susceptible to hacking. Altus Network Solutions, Inc. is a Microsoft ISV partner located in Alpharetta, Georgia. Altus has provided consulting, training and software development services since 1997.